TissueStack has a simple external query interface that allows other applications and researchers to integrate the data in the application to their own systems. In order to achieve this, TissueStack supports embedding in other pages. This version allows a user to embed a light version of Tissue Stack into any website with only few lines of code via the TissueStack web API. The technical details for this are in a previous blog post here. TissueStack allows for data display from multiple sources running a TissueStack server via data federation. This is achieved as the connection to a dataset on a client is via a socket connection to a TissueStack Server. This means that a single TissueStack Client can connect to multiple servers so long as they are internet accessible. 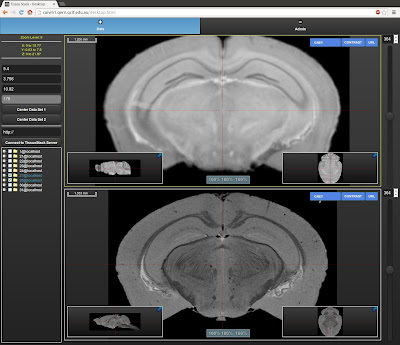 The interface for this is in the TissueStack Client via the "connect to Tissue Stack server” button on the left of the main image pane. All that is required is the corresponding URL of the server at which point the two instances datasets can be viewed. The screenshot below shows a demonstration Tissue Stack instance connected to both a remote server and a server running on the localhost. This information is displayed in the list of available datasets. 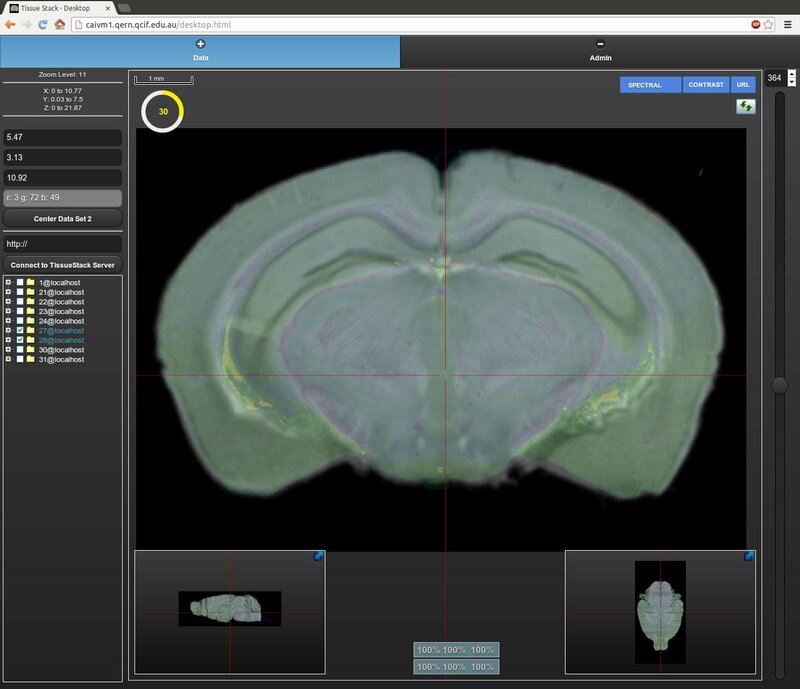 TissueStack permits the comparison of mutant vs. wildtype image data and will allow for morphological investigation of differences between the two. The most common form of morphological comparison used for voxel data is to use either a combined view of both datasets or to overlay them. TissueStack supports both of these types of image comparison. As part of this the datasets are also synchronised via the inbuilt coordinate system (typically in mm). These two screenshots show the two styles of dataset synchronisation (side by side and overlay) In the case of the overlaid datasets, the second image has been set to use the Spectral colour map. Control of the synchronisation and overlay is via the admin tab. When in overlay mode a new control is shown in the top left of the image pane, this controls the opacity of the overlaid image such that the image behind can be seen. A design goal of TissueStack has always been to develop a system that can be easily downloaded, installed and configured on a standard architecture by a relatively competent user for use at local sites. The TissueStack server has a plugin architecture such that future modules for additional reference data can be added. The client side code is all coded in HTML5 using standard methods and HTML elements, as such by its nature it is infinitely extensible and embeddable. The plugin architecture API that is used on the server side of Tissue Stack is documented on github here. This mechanism allows external or future developers to implement and add new functionality. The plugin system also allows plugins to be included or removed without shutting down the server. Each plugin shares all data structures with the core server and can also interact with another plugins. 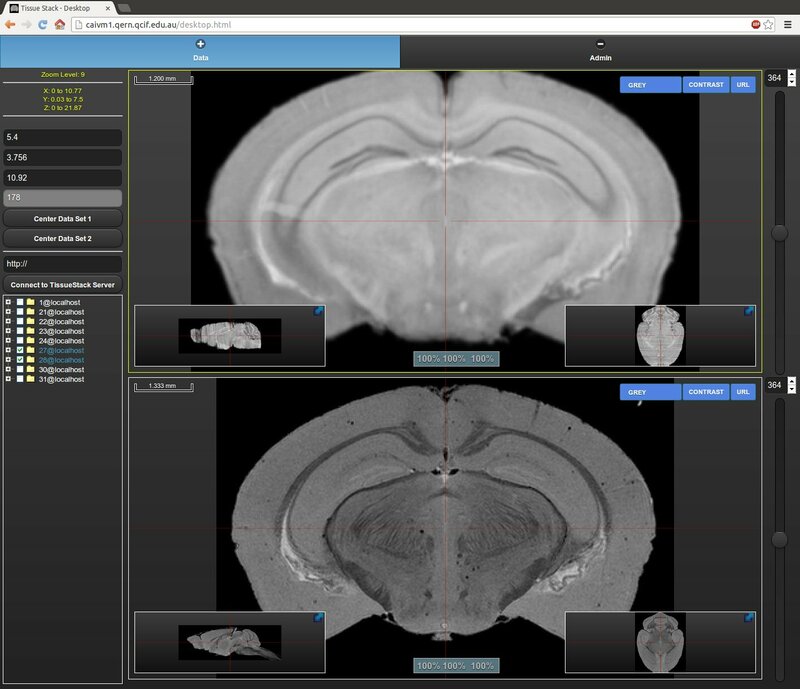 TissueStack has an interface to link additional anatomy metadata such as lobe and structure names to the image data being presented. This allows us to link labelled data and structure names to specific co-ordinates or areas. The eventual goal of this link is to allow the comparison of structures not only between two similar datasets but between species were there are homologous structures. A good example of this would be the hippocampal formation that exists in most higher order vertebrates. The screen shots below show how the current interface to this works, it is possible to associate a particular area of a dataset with a label, this label data is displayed when the co-ordinate centre is overlaid on an area. In both of these the label data can be seen in the top left corner, a label (“yellow (hot)”, “middle of brain (spectral)”) is associated with a specific colormap and dataset.